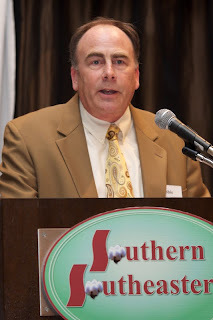 At the recent Southern Southeastern Annual Meeting, the Board of Directors of the Southeastern Cotton Ginners Association, elected Robert Waters as its President for 2011 and 2012. Waters runs the Edwards Cotton Company in Scotland Neck, NC. Robbie has been a long time member of the organization and a director for many years before being elected to the Executive Committee 5 years ago. Waters has been working at Edwards Cotton Company since 1976 where he has helped the gin grow from about 4,000 bales per year to over 50,000. In addition to his serving as a director and officer, Waters has been the long-time chair of the Safety Committee, one of the most active committees in the Association. He is also active on the Warehouse Committee and has been instrumental in working on some of the issues facing gin-owned warehouses. Additionally, he was awarded the 2007 Ginner of the Year at the 2008 Annual Meeting. Waters has been a member of the Scotland Neck Community Hospital Board as well as having served on the local EMS squad for many years. He is a member of the Scotland Neck United Methodist Church and has three daughters. We look forward to Robbie’s leadership for the next two years.